We offer in office Zoom whitening. With Zoom whitening, it’s possible for your teeth to get up to eight shades whiter! This will help you reverse and coffee, food, and aging stains that you may have. Your treatment starts with Dr. Jasmine Naderi checking your current dental shade, so that you can see your shade difference once your treatment is completed. After we check your shade, Dr. Jasmine Naderi will prep your mouth for the whitening and applies a gel onto your teeth. To speed up the whitening process, we will shine a blue LED light lamp onto your teeth. This is repeated three times, and treatment is complete within 45 minutes! Yes they are. The contain very safe chemicals in gel form, which enhance your smile and whiten your teeth. Can teeth whitening damage your gums? In office whitening may damage your gums if the chemicals enter your gum tissue. 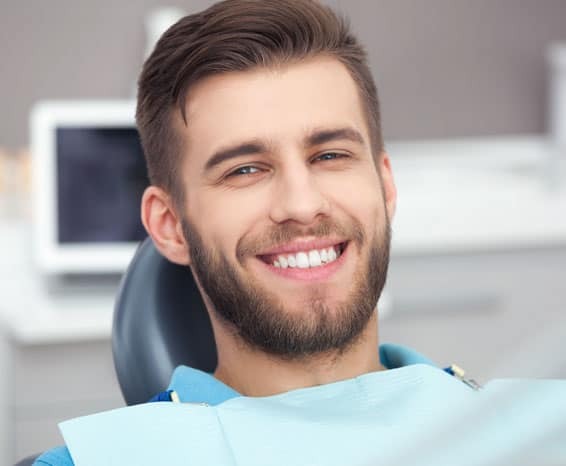 Fortunately at Best Dental, we have materials that cover the gum tissue to prevent any gum damage from occurring. Can teeth whitening damage your teeth or enamel? No it cannot. The gels are specially designed to remove staining, and not to damage and vital tooth structures. Can teeth whitening cause permanent sensitivity? No. Teeth whitening’s effects do not last indefinitely. After a few days the discomfort will go away, and you will have a whiter and more beautiful smile. Are whitening strips supposed to hurt? Yes they can. Initially when the chemicals penetrate into your tooth structures they can cause sensitivity, especially to hot and cold. No it is not. Staining will happen again. When you teeth will stain depends on home care and well you take care of your teeth. Most in-office whitening sessions last for up to 6-12 months. Can teeth whitening for on crowns? No they can’t. Crown colors are permanent and cannot be changed. Can teeth whitening give you headaches? There is no correlation between teeth whitening and headaches. Can teeth whitening get rid of stains? Only internal stains (stains seen within the tooth structure). External stains on the surface of teeth will require a profession dental cleaning. Can teeth whitening cause mouth ulcers? Yes they can. If the chemicals get on your gum or cheek tissues they can temporarily cause blistering and tissue damage. These ulcers heal within a few weeks. Can teeth whitening damage fillings? No they cannot. Fillings are not damaged in any way from whitening gels or chemicals. Teeth whitening consists of chemicals that penetrate into your tooth structure to dissolve the particles that are causing your teeth to stain. How does the teeth whitening light work? The blue light seen with in-office whitenings helps the gel chemicals to penetrate into your tooth structure. We hope these FAQs and answers helped you understand teeth whitening a little better! If you are near the Richmond, TX area and are in need for a whitening session (for a wedding, special event, or to improve your own confidence) contact Best Dental today!